Here we are, at the fifth and final story of this little project. This has been a really fun exercise in mixing various critiques I’ve made of Halo 5 over the last three years with more creative expression, writing scenes I’d have loved to see and expanding on some of the ideas found throughout the campaign and intel logs. But all things must end, and new horizons await us as 2019 approaches. 100,000 years ago, the Didact made a choice. 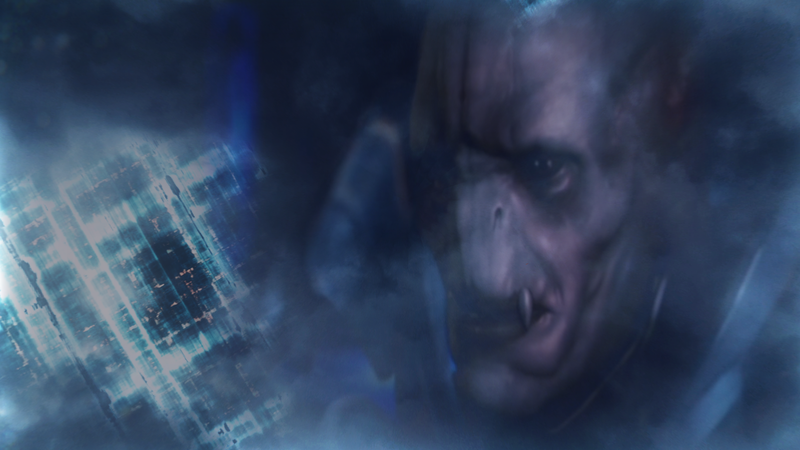 As a result of that choice, a guilt-ridden Sangheili, trapped on Genesis and grieving for his Unggoy commander, discovers a new purpose… This will be a little different to the previous four entries because I have a bit of theorycrafting to start with. The idea for this began with the Promethean Knight in Exuberant Witness’ zoo, seen in the final mission (Guardians) of Halo 5. We see this Knight in a cell in what can best be described as a frantic and depressed state, swinging its arms and hitting its head against the wall before holding its head in its hands. It was a brief and rather horrifying glimpse at the humanity within the Knight, something that I feel hasn’t been explored to the extent it should’ve been. During the process of writing this and explaining how this particular Knight came to be, I found that the idea expanded to encompass explaining how the Ur-Didact was able to be Composed in Halo: Escalation‘s The Next 72 Hours arc. The self-aware Knight in Exuberant’s zoo? That’s… not uncommon. The mind is a complex thing and the Forerunners didn’t entirely understand how the Composer works, as it utilises the Precursors’ arcane neural physics in some capacity. I thought to tie this back to one of the opening lines of Halo 4. The man/machine theme of Halo 4 operates on a small-scale with its exploration of the relationship between John and Cortana, but on a higher level it expands to the parallels drawn between the now-mass-produced Spartans and Prometheans. The mind of a child would be more malleable, to be programmed into war machines… so they make for better Knights. Something I studied as a teacher was how a child’s brain develops, how synapses are formed as connections are made over time and experiences become learned. One might draw comparisons with the Forerunners’ process of mutation as well, where advancement is only possible with a certain perspective and acceptance of the Mantle – this is explored in particular depth in Halo: Cryptum. But the Ur-Didact is not at-peace, as we see he botches his mutation in a supposed attempt to gain immunity to the Flood. Apparently, this means the Composer “will not work” on his new form. As we saw in Halo: Escalation, he gets ‘supercomposed’ on Installation 03 as the control room is ejected from the ring. Where many of us have taken issue with this, I believe I have a more satisfactory answer to offer. The Didact knew that he was further from the Mantle than he’d ever been. He knew that he carried some form of the Logic Plague from his traumatic encounter with the Gravemind, and so he feared that he might’ve ‘infected’ the other Prometheans if his mind was transformed into machine data to become one of them. The result, one way or another, could only be greater pain, greater suffering – all misery was but sweetness for the Primordial’s grinding mill. And he had died a thousand times since the day that it did, after he had been lifted out from the Domain by a child and brought into the Gravemind’s embrace. The light shunned them now, driving them further into the darkness – even their new capital had to be situated outside the galaxy. A holographic representation of himself appeared as his body was scanned. As he expected, it almost instantly curdled and distorted with hideous growths. “That leaves only the Composer,” spoke The Strategos. It was this old general, this grizzled ancient of the Kradal Conflicts, who had gladly supplied his mentorship to the Didact for his brevet-mutation. Dham ‘Mashatt could not remember the number of people he had killed. 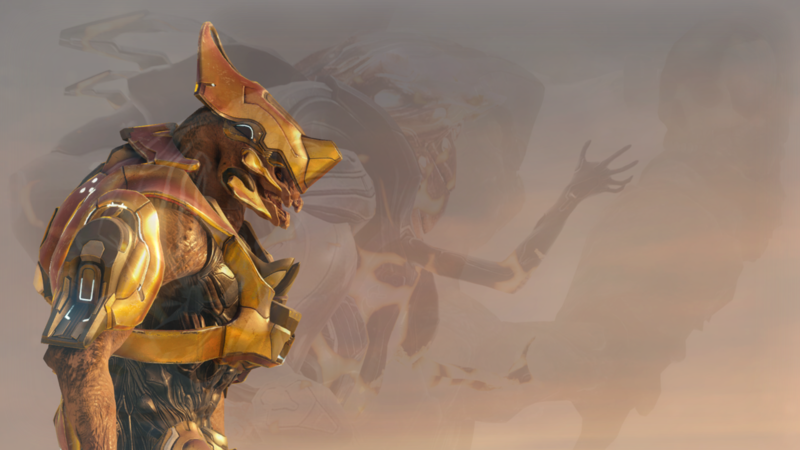 Any who saw him would immediately know from his golden armour that he belonged to the Warrior class of Jul ‘Mdama’s Covenant – a veteran of the war with the humans who had pledged his allegiance to the Didact’s Hand. He waits for me, standing at the cliff edge – his back to the holy city of Sunaion. We are alone, he and I, far away from the rest of the camp. He senses my anxiety. The lives he had taken then, he hadn’t given a second thought to. There was only the next fight. He speaks of family, of love for the squad he leads – for me. He speaks of blood spilled and brothers mourned, of lives spent and wasted. He cannot bear to lose any more. Our movements and strategies, all given to the Swords of Sanghelios – given by the one we looked to for honour and wisdom – for the promise of capture. But now… he was trapped – imprisoned behind an energy shield, in a cold grey cage in the home of the gods – like some wretched animal on-display. And he had nothing but time to think. I cannot look into his eyes as my blade pierces his heart. He had known that there would come a terrible day where he would start counting the lives he had taken, and it was with the first one that he wanted to howl and claw at the walls for all that it was doing to him inside. It was the way of the Sangheili to honour their greatest warriors through ballads, and while Dham was no poet, no great orator, he tried to honour his fallen leader the only way he could think. Holding out a datapad, he had recorded something that was as much a confession as it was a eulogy. “His name was Bibjam. He was a mere Grunt, scarred though spirited; past his useful years. His advice was unconventional: fight as if there was no honour in death. He guided us through victory in conflict after conflict. And while we revelled in our glory, he mourned every brother we lost along the way. As the war went on, Bibjam became more concerned with protecting us. 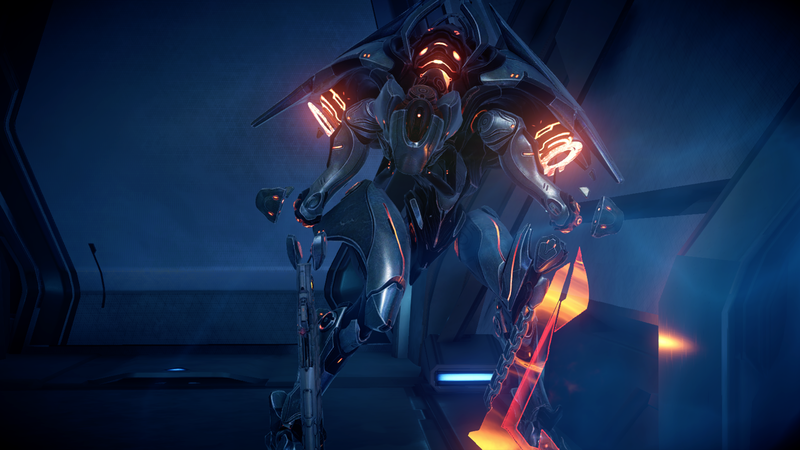 When we finally caught him betraying our movements to the Swords of Sanghelios, he told us capture was the only way for us to avoid death. He truly believed he found a way to save us. That was the moment Dham knew he was lost. He had thought, at the time, that duty surpassed family. The reality he had to face was that the Covenant had fallen, that such a thing had always been inevitable, and that family was all he had left. Betrayal of one’s duty was one thing, but betrayal of one’s family… it was a crime beyond measure. Dham’s sojourn in this place had revealed to him that he had done both. Glibip, an Unggoy of the squad (his squad now, he supposed), had been clawing at the energy shield with that mix of fervent desperation and unyielding determination that he had come to respect so strongly about their race. But something had made them stop. The energy shield wall of Dham’s cage disappeared. He got to his feet, scrutinising the construct before him: a Monitor, created by the Forerunners. All that personality crammed into a tiny metallic sphere with a single purple eye. Within was contained another Forerunner construct. A large, top-heavy carapace adorned its back; it had two pairs of arms, one connected to its weaponry, the other pair were smaller and more dexterous; and a monstrous face that could open and give way to the blazing skull beneath. This was a Promethean Knight. “Is it… crying?” Dham approached, caught by the spectacle. Dham watched in great discomfort as the Knight thrashed around in its cell. It smaller arms slapped at its head, as if trying to wake from some terrible nightmare, then it threw its weight against the wall and sank to its knees. It got up, shook uncontrollably, then repeated the process again – as if caught in a recursive loop. Unable to speak. Unable to cry out, in pain or anger or madness. Dham had seen terrible things – done terrible things – and, in processing that, found a felling that tugged at him inside and made him want to weep. “Explain,” he demanded of Exuberant. No longer could Dham see the divinity of the Forerunners, the awe that had been instilled in him from his own childhood as he had prepared to give his life to and for the Covenant. If they had been gods, then they were cruel and unworthy of worship. And if they had not been gods, then they – like the Covenant – were simply cruel. He had broken his own programming, Dham supposed, leaving him only with pain – a deep awareness of what he had taken from life to allow himself to be. It ignited a guilt within him that a thousand blades could not cut through. Exuberant Witness felt this question deeply. For over one hundred thousand years, she had remained on Genesis and dreamed of visitors that would never come. Of company she could never have. She had contented herself with the duty she was charged with: to serve as Monitor for this old world, that had so long ago been irradiated beyond habitability by early attempts at stellar engineering, and restore it to the verdant paradise it had once been. This was a place of life. Exuberant had lost herself for millennia in building seed worlds and sustainable ecosystems, it had been the only distraction to prevent her from succumbing to the madness of isolation. But now, the visitors she had longer for were here – pulled from across the stars by those vile engines of nightmare – and destruction had followed in their wake. Does anything of the Forerunners remain, besides their weapons? Dham recalled the stories of a great library that held the souls of those who had passed, filling it with the knowledge and wisdom they’d accumulated. According to the Covenant, it was where the souls of their faithful fallen went to find peace before they all transcended on the Great Journey. “And if we took this Knight – this… human – to the Domain, it might be healed?” Dham asked, a glimmer of hope, the shadow of an idea forming in his mind. More energy shields from the other cells dropped. Two Unggoy and the towering form of a Mgalekgolo, who had long since lost their bond brother, stepped out and gathered at the centre of the Monitor’s menagerie. Magsunog gave a low rumble, their head tilted slightly to the side to indicate confusion – something they had picked up from the Unggoy. After Dham explained everything to them to them – from Bibjam’s attempt to save them, to his own betrayal, to the circumstance they found themselves in now and the true nature of the Prometheans – he presented the choice they now faced. They could leave. They could find off-world transport pulled in by the Guardians and Exuberant could open a portal to go… somewhere else. Or, they could remain here – on Genesis. Honourable as Bibjam’s intentions were, his mistake was that he had not trusted any of them with his plans. He had acted for them, taking their choice away. That was a mistake Dham would not repeat. Such a decision could not be imposed or forced on his protectorates, it was one that they had to make like they had made everything else. I fear for the galaxy we fought so hard to save. It sounds as if the Librarian’s plan has wrought a galaxy that will see no end of conflict over the Mantle we so hideously squandered. Our weapons, the crude instruments of destruction we used to fight an unwinnable war, have become sharp sticks in the hands of children ill-equipped to understand them – just as we once were. I fear for what greater judgement may one day arrive, that they shall have found themselves so zealously trying to claim the top of the hill that the victor will find no allies when the nightmare awakens and returns. But my responsibility is to protect and preserve – not just this world, but all life. I will not allow innocent lives to suffer, not when I can help. They are here and the galaxy is not what we intended, that is simply the way it is. And so, once again, I face the question: what can be done? The answer lies with these visitors. If I can reach out to them, if they can find it in themselves to put their arms aside and discard their wrath, they may yet be saved. One way or another, I would witness this galaxy know that we can change. And they shall be my example. Completed an excellent set there! My congratulations. Go for it, that’s good with me. I really liked the idea of tying the Strategos in with the Warzone boss that appears in Halo 5, as it’s not made clear whether or not it’s actually the Composed Forerunner of the same name or something else. Since we know nothing about his backstory, he’s name-dropped in Cryptum once, you’re pretty much free to make what you will of the character. Thanks – look to see “Begging After Knowledge” in complete form on fanfiction.net by next month (maybe) – and with two more stories planned, if I can muster it.